« Colon or Garcia: With No Right Answer, How Can Yanks Go Wrong? The Yankees rounded out their rotation this morning by naming Ivan Nova and Freddy Garcia as the team’s fourth and fifth starters, respectively. It was also announced that Bartolo Colon would serves as a swing man in the bullpen, similar to the role Alfredo Aceves performed when healthy over the past three seasons. 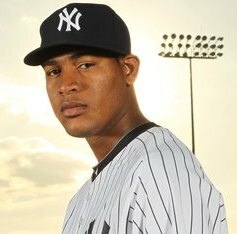 Is Ivan Nova ready for the bright lights of being a major league starter? Although the spring battle for the rotation was billed as an open competition, the decision to go with Garcia over Colon wasn’t really surprising. Heading into camp, it seemed as if the Yankees preferred Nova and Garcia in the rotation, so it wouldn’t have made much sense to change plans based on 15 exhibition innings. As previously noted, however, the Yankees rotation will remain very fluid throughout the year, so by no means are these assignments set in stone, especially with Kevin Millwood now in the fold. During March, a lot of attention was paid to the Yankees’ cavalcade of veteran starters, which collectively resembled more of an Old Timer’s Day All Star team than an opening day roster, but the real story that emerged from camp was the performance of Ivan Nova. In addition to posting a 1.80 ERA in 20 spring innings, Nova also impressed observers by quickly learning how to throw a new pitch. Under the tutelage of Billy Connors last October, Nova adjusted the grip on his slider, effectively turning the pitch into a cutter. During the spring, Nova used his new pitch to great effect, but it remains to be seen if he’ll enjoy the same amount of success once the games start to count. Combined with his already impressive fastball, above average curve and functional changeup, however, the addition of cutter makes Nova a much more dynamic pitcher, and perhaps one worthy of lofty expectation. After all, Connors has a pretty good track record teaching the cutter. Just ask Greg Maddux and Andy Pettitte. Before getting carried too away about Nova’s prospects for 2011, several question marks remain, not the least of which are his youth and inexperience. It’s easy to lose sight of his Nova’s age because he has been overshadowed by the Yankees other more high profile prospects, but the right hander is only 24, which is younger than Phil Hughes, Joba Chamberlain, and even Andrew Brackman. However, with youth comes uncertainty, so any optimism about Nova must be tempered. After all, if history is a guide, he probably won’t even spend the entire season in the rotation. For perspective, in the franchise’s 110 year history, only 23 pitches have posted at least 25 starts in a year before their age-25 season, and only 13 have done so since 1961. Furthermore, only seven Yankees’ pitchers have accomplished the feat in their rookie season. Can Nova become the eighth? By the time October rolls around, the Yankees starting rotation could look vastly different than it does today. Just don’t be surprised if Nova is still in it. Although names like Garcia, Colon, Banuelos and Betances have dominated the spring, Nova could wind up being the pitcher who is talked about all summer.